Location: Near Santillana del Mar, Cantabria, northern Spain. 30km west of Santander. Motorway A-67, exit Santillana del Mar, National highway 611 and Autonomic road 6316 to Santillana del Mar. Follow the signs to Altamira Museum. Open: Museum and replica: MAY to OCT Tue-Sat 9:30-20, Sun, Hol 9:30-15. NOV to APR Tue-Sat 9:30-18, Sun, Hol 9:30-15. Closed 01-JAN, 06-JAN, 01-MAY, 16-SEP, 24-DEC, 25-DEC, 31-DEC.
Fee: Museum and replica: Adults EUR 3, Children (0-18) free, Students EUR 1,50, Researchers EUR 1,50, Seniors (65+) free. No fees on 18-MAY (International Museum Day), 12-OCT (Columbus Day), 06-DEC (Constitution Day). Address: Altamira, E-39330 Santillana del Mar, Cantabria, Tel: +34-942-818005, Fax: +34-942-840157. 1868 cave discovered by chance by the hunter Modesto Cubillas. 1875 first exploration by Marcelino Sanz de Santuola, a nobleman from Santander. 1879 the first paintings were discovered by Maria, the daugther of Marcelino de Santuola. 1880 first publication of the paintings by Marcelino de Santuola: Breves apuntes sobre algunos objetos prehistóricos de la provincia de Santander (Brief notes about some prehistoric objects of the Santander province). 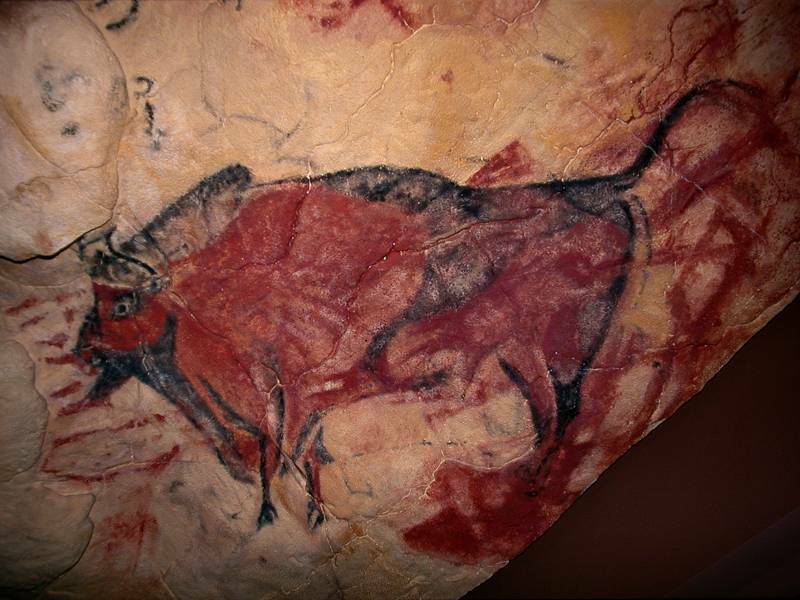 1902 the prehistoric age of the Altamira paintings was recognized. 1962 first copy of the cave made by the Deutsches Museum. 1964 second copy made for Madrid. 1977 closed for the public. 1982 reopened on a strictly limited basis. 1985 enrolled on the UNESCO World Heritage List. 1991 first dating of the paintings with the C14-dating resulted in about 14,000 years. 17-JUL-2001 Altamira II, a nearby artificial reproduction inaugurated by Spains King Juan Carlos and Queen Sofia. Image: one of the numerous bisons. The Altamira Cave consists of a series of rooms and passages shaped like an S. The main hall lies about 30m from the entrance and measures about 18 by 9m. The world famous feature of this cave is found on the ceiling: coloured paintings, mainly from the beginning of the Magdalenian period, about 15.000 years ago. Most paintings show bisons, but there are also two wild boars, some horses, a hind, and some other figures in a simpler style. There are eight engraved anthropomorphic figures, various handprints, and hand outlines. The surprising quality and exceptionally well preserved state of the paintings caused the specialists to doubt whether they were genuine. Their discoverer died before his find had been officially accepted as authentic. At the beginning of the century the scientific community accepted them as unadulterated, after several comparable remains from the stone age were discovered in this area. But Altamira is still the most exceptional evidence of the Magdalénian culture in southern Europe. Image: a replica at the Deutsches Museum (German Museum), Munich, Germany. The habitation of the cave starts in the Aurignacian (Perigordian) period, to which the first figure-like symbols etched in the walls belong. It was used more intensely in the Solutrean and Magdalenian periods. Proof of the habitation are the abundant stone material and the organic remains dated with the C14-dating. The drawings show bisons, horses, red deer and boar. The animal figures are large scale, e.g. the red deer is 2.20m long. It is surprising because the artists very painstakingly depicted its specific and sexual features. Basically, the pictures are dynamic and the movement of the animals comes to life through the thoughtful use of the reliefs and uneven surface of the walls, thus creating a breathtaking effect. Another outstanding aspect is the variety in the texture of the furs and manes of the different species painted on the rock surface. It is created with a minimum of facilities and with the restrictions imposed by the use of only three shades of colour: ochre, red and black. In the complex of painting in the cave, bisons in different positions are most common and carried out most expertly. Other drawings, described as anthropomorphous, show humans with animal heads as well as different signs, such as hands or comb- and step-like symbols difficult to explain. Like in Lascaux, an artificial copy of the cave exists, which is part of the nearby Museo Nacional y Centro de Investigación de Altamira. It was built by the spanish Architect Juan Navarro Baldeweg and is a complex containing a museum of prehistoric art, a research institute, a restoration laboratory and the original size reproduction of the central room of the cave which is 9*18 m big and contains dozens of images. The whole complex costed 25.5 Million EUR. It was inaugurated by King Juan Carlos of Spain and Queen Sofia on the 17-JUL-2001. The new replica of the cave was truly a success: 200,000 visitors during the first four months is really exceptional! In 2008 British scientists dated the paintings with the U/Th method. Before the carbon of the charcoal in the paintings was used to determine the age of the paintings using the C14 method. Obviously this works only for the black parts of the paintings which contain carbon. Uranium decays to thorium and this process happens in any kind of calcite deposit. This method measures the uranium and thorium content in flowstone crusts which grew on top of the painting. As a matter of fact this method only gives a minimum age, but it is usable also for engravings and paintings without charcoal. 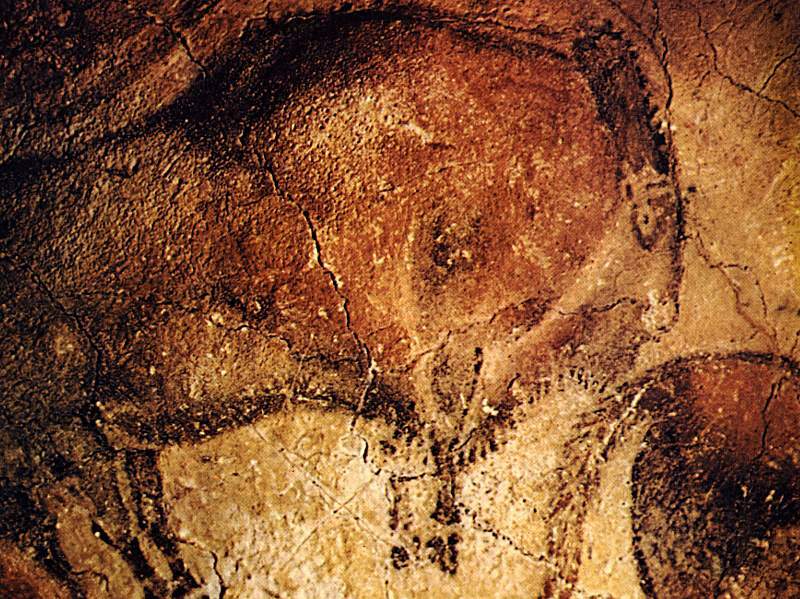 The results are astonishing: parts of the artworks are between 25,000 and 35,000 years old. The access to the original cave is extremly restricted. The carbon dioxide CO2 breathed out by visitors damages the old paintings, dust from the clothes covers the rocks, starts to decay, seeds of plants grow in the electric light. As a result the cave was closed in 1977. But the demand to allow at least a nominal number of visitors was high, so the cave was reopened in 1982. The number of visitors was drastically limited, only 160 visitors per week were allowed to the cave, the tours were booked out for three years in advance. With the opening of the replica the cave was closed again in 2002. In 2010 the Spanish government planned to reopen the cave, but after a multidisciplinary international group of conservation experts was set up to determine what impact human presence has, this plan was changed. Museo de Altamira, ( ) official website.